Wading through the digital storefronts of your preferred platform can be overwhelming, especially with releases from certain genres popping up more frequently than ever before. It’s becoming increasingly easier to miss or overlook titles with less fanfare surrounding their release. With that being said, Momodora: Reverie Under The Moonlight recently released on the Nintendo Switch and is the fourth game in a series you’ve probably never played– or maybe even heard of. This prequel to the Momodora series is a gorgeously animated side-scrolling adventure game with a focus on precision platforming and fast paced combat that isn’t afraid to punish when you slip up. Reverie Under The Moonlight tells the story of Kaho on a quest to save her village and the world around her from an evil that’s seeping from the queen’s castle. There isn’t an abundance of narrative weighing the player down, yet a maze of paths laden with enemies that lead you to and from varying locales on your journey to discovering how to stop the curse from overtaking the world around you. I found each setting visually appealing and unique from each other, while still holding onto the essence of the tale’s grimacing tone. Even with an interesting art direction and a decent soundtrack to accompany it, the action and platforming are on center stage in Reverie Under The Moonlight. The combat focuses on blending spells with melee and ranged combos, dodge rolling, and learning the enemies attack patterns in the vein of another game that gets referenced too often in reviews. The core movements and attacks never change too drastically down the line, but the fluidity once you get the hang of dancing through battles and trekking across platforms is the most rewarding aspect of the game. In turn, this succinct gameplay never let the somewhat lack of variety in attacks become a stale experience for me. In addition to the combat mechanics, there’s an upgrade system in the form of equipable passive and active skills and spells that help augment Kaho so that you can overcome the terrain and enemies that you encounter. Although, I found myself rarely changing my load-out once I found the optimal equipment for my play-style, except against certain boss fights. Though, this could just be a case of the difficulty I was playing on– normal– and my skill at the game. 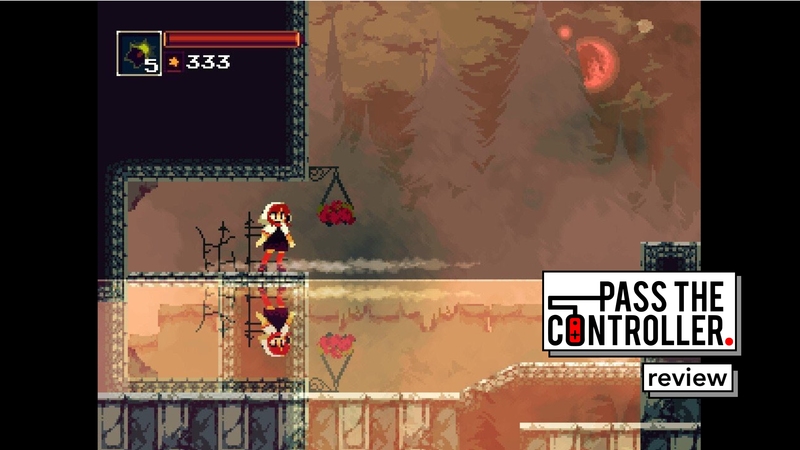 There are hints of Metroidvania here but ultimately Momodora is just a connected set of levels that doesn’t require too much backtracking and puzzle solving. At a certain point in the game you acquire the ability to fast travel between the checkpoints– bells– located throughout the game. This little feature eliminates some of the tedious moments of having to retrace steps in order to progress. An ability like this within this type of game respects the player’s time, and is one of the best quality of life inclusions this type of game can have. These same bells also serve as a restarting point for when you fall to an enemy or miss the right jump, and the balance of how often they appeared felt like the right amount. The pressure of moving forward knowing how far back the last checkpoint was kept me on my toes and cautious. With only a small amount of story beats coming from mandatory encounters and optional NPCs conversations offering more depth into the narrative, choosing to learn more about the world is up to the player and not shoveled down your gullet. So even if you are just looking for a satisfying combat centric action platformer and not a story driven experience you can whet your appetite here. Reverie Under The Moonlight is a perfect addition to your Switch library if you’re looking for a smaller scale but largely fulfilling action platformer. Though I didn’t feel like RUtM brought anything drastically new to the genre, after completing the entire map, collecting everything on my first playthrough, I was content with the couple of hours I spent diving into the world of Momodora and will miss it’s captivating pixel art and enthralling combat. Reverie Under The Moonlight earns its keep amongst a genre full of incredible games. Momodora: Reverie Under The Moonlight, originally released on Steam and PlayStation 4 in 2016, released on Xbox One in 2017, and was recently released on the Nintendo Switch on January 10th, 2019.